Laptop computers have become a necessity due to its convenience for everyday users—be it for work or play. However, owning one takes a lot of investment, both financially and emotionally, and sudden and unexpected issues can not only disrupt work, but also bear undue stress because of the inconvenience of going through repairs and uncertain warranties. With the constant aim of improving its user’s experiences, ASUS goes one step further to offer the excellent after-sales service to its end-users. Enter the ASUS Premium Care (APC) program, a warranty extension and service upgrade package available to end-users who have purchased their devices within the last 90 days. For a cost of PHP 3,499.00, APC is a perfect tool for end-users to extend the longevity of their devices, allowing them to upgrade their existing device warranty from the standard two-year global warranty to a country’s first, industry-leading three-year GLOBAL warranty recognized in over 50 countries worldwide. Comparable three-year warranty packages from competing products only cover local warranty at a cost of up to PHP 6,300.00. 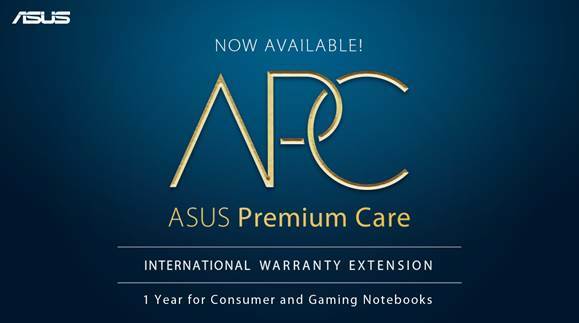 All ASUS laptops are eligible for the additional 1-year APC warranty extension package, with a few select models eligible for an optional change to the on-site warranty upgrade. To avail of the APC package, end-users first need to check if their device is qualified and matches the product indicated in the APC package they want to avail. For on-site warranty eligibility, end-users should check if their area is covered by ASUS Authorized Service Providers (ASPs) via bit.ly/apc-onsitecoverage. Upon confirmation of their eligibility, end-users must register for an account at http://account.asus.com, and register their product to tie it into their account. Afterwards, end-users may proceed to the Service Package Activation tab on the website and input their APC package details. In addition to accessing their warranty status on the website, end-users can also check service center locations, as well as status of their warranty and repairs via the MyASUS mobile app. A 22-day turn-around time commitment ensures that their service requests are as smooth and convenient as possible.